The Mythic Oil range has been quite hyped since it was launched last year, so I was quite curious to try this when I got a full size bottle (worth about 15€) in the February Deauty box (our local beauty box). ArganOil: used for centuries by Moroccan women, ArganOil is rich in Vitamin E and Omega 3 oils. It easily absorbs into the hair to deeply nourish and provide control. Unfortunately, I can only say this is quite overhyped. It's not terrible, but it's definitely nothing exceptional. The texture is clear and it has almost no smell, which is good if you don't like strong scents. I would have thought the oils in it would have smelled of something, though. So far, so good. On the other hand, this is not SLS free and this is full of silicones, which means your hair will look shiny and soft, not necessarily from the Argan oil, but from the silicones, which will build up on your hair. I actually wash my hair about 6 times a week (don't tell me that it's bad, I've been doing it for 20 years and I'm not bald yet), and this is marketed as a gentle formula for daily use. I actually found that it dried up my scalp quite a lot after 4 or 5 uses so this is definitely not something I'd recommend using daily. 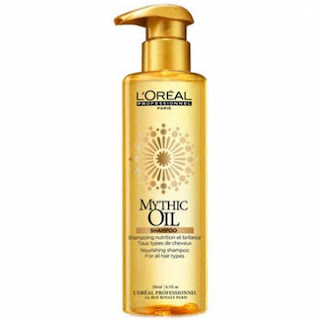 It's also a bit of a paradox that this product would claim to reduce the oils (which it does, I suppose) and to be good for daily use at the same time so I guess we know which one is true now. I would definitely not spend 15€ on that shampoo that doesn't do anything exceptional at all, is full of chemical stuff, and can't be used daily without drying out my scalp. I know of some drugstore shampoos that are way better than this one. Sorry L'Oreal, for me this is a fail.